‘Punga’ is a quintessential Kiwi word used to refer to tree ferns or sometimes, more specifically, the trunks of tree ferns. But in his book A Dictionary of Maori Plant Names, James Beever does not record any tree ferns as being called punga by Māori. I don’t know for sure, but I suspect that ‘punga’ is an English corruption of ponga. Does anyone know otherwise? Ponga is the silver fern Cyathea dealbata, which is a real plant and not just a marketing creation! Adult ponga are immediately recognisable by the white undersides of their fronds, and they can be identified even at a distance by the white tinge of their fronds’ stems. 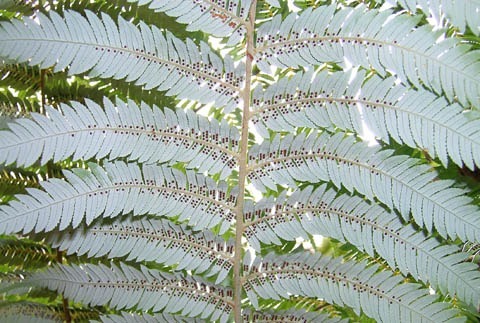 The white underside of a frond of ponga, Cyathea dealbata. There are two main groups of tree ferns: Cyathea and Dicksonia. They are easily distinguished since the former is scaly and the latter is hairy. Koru, or young uncurling fronds, of Cyathea (left) and Dicksonia (right). 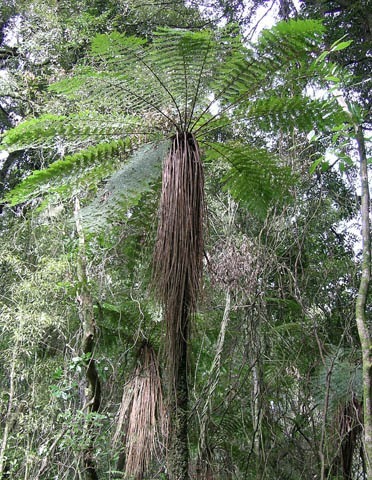 Besides ponga, the other prominent Cyathea in New Zealand are mamaku and kātote. Mamaku, or Cyathea medullaris, is our tallest tree fern, with thick, black frond stems, and it is a common coloniser of hillside slips. Te Papa has a specimen of mamaku collected in 1769 during Captain Cook’s first expedition. Kātote, or Cyathea smithii, is recognised by its retention of dead frond stems as a ‘skirt’. It is more common in colder habitats. Whekī (pronounced ‘fare-key’, with emphasis on the ‘e’ sound in ‘key’) and whekī-ponga are the prominent Dicksonia species in New Zealand. Whekī-ponga, or Dicksonia fibrosa, retains a skirt of dead fronds, and its trunk can reach a comparatively massive girth. Whekī, or Dicksonia squarrosa, is commonly found around streams and other wet areas. 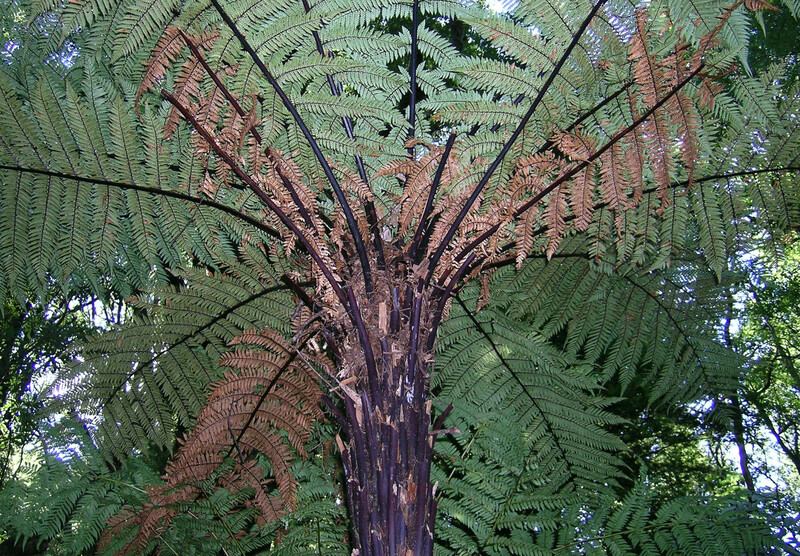 Even as young plants, whekī and whekī-ponga can be easily distinguished by the colour of their fronds’ stems, which are brown and green respectively. Whekī forms buds on its trunk, and it can resprout if the main crown is damaged – or if the fronds and roots are cut off and the trunk is used to make a fence! Many pungas for sale are not actually ponga but whekī. If you want to make a wall of tree fern trunks that has a reasonable chance of coming back to life, ask for whekī. 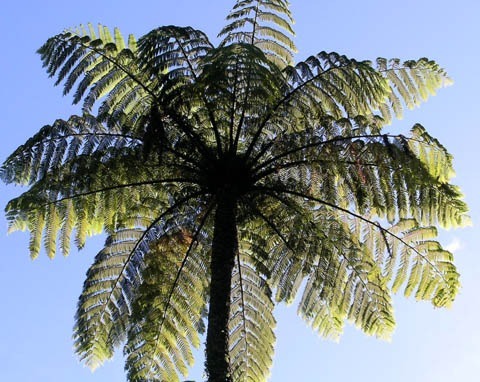 All of New Zealand’s tree ferns are described and illustrated in the book New Zealand Ferns and Allied Plants, by Patrick Brownsey and John Smith-Dodsworth. 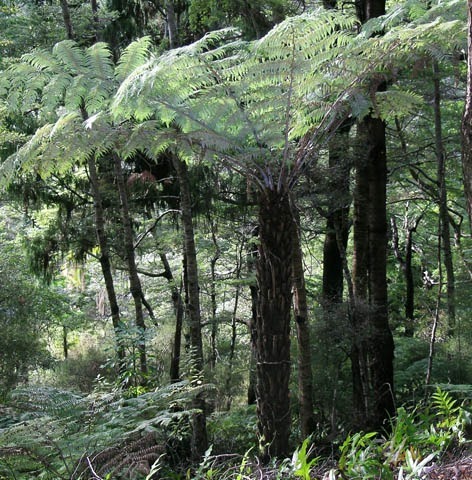 Read a more comprehensive account of New Zealand’s tree ferns. Thanks so much for the info. I never realised there were so many different types of ferns! Hi there, i have a large Dickinson punga and want to grow some more from it. Is it possible to grow Dickinson Punga from cuttings? If so, how should I do this? I wondered if cutting off one of the mature koru from the centre and planting in potting mix and mulch might work. Thanks! Hi Paul. I haven’t heard of propagating ferns by cuttings. I really doubt it would work, sorry. Some ferns produce bulbils (like the hen and chickens fern) that make vegetative propagation easier. If you had a wheki tree fern with buds on the trunk, and layered the trunk (laid it down in soil), maybe you could get it to produce multiple individuals, one from each bud. You can work out what kind of tree fern you have from the pictures/links. But I reckon that would be a long shot. Otherwise, you can try cleaving the rhizome (~ root stock) into separate pieces. I’ve done that with small ferns. I doubt very much that it would be successful with a trunked tree fern. If you want more tree ferns, I suspect you have to acquire more individuals that have been propagated (either naturally or artificially) by spore. I purchased a dicksonia squarrosa from bunnings. We planted it in August. Unfortunately we were hit with a heavy frost. Now the leaves have turned brown. Should we cut them off or has the plant died. Depending on the species, they may be connected to the adult tree. Regardless, I think there is a reasonable chance you’ll be able to dig them up and replant them. Try digging up one. If it has well-formed roots, it should be fine. Hi, I cant find the answer to this anywhere and might be a silly beginner question, but can I grow a wheki in a pot and keep its size small? Or will it need to be planted out eventually? I’m going to guess that you can keep wheki in a pot for a fair while, and that keeping it in the pot will act to stunt its growth. But eventually it will start looking unhappy and/or out-grow the pot. There are plenty of native ferns that suit pots of whatever size, and whether it be indoors or outdoors. A good nursery should be able to advise. Hi, Sorry this is proably a stupid question but I have several Ponga’s that are to tall, and blocking out light, can you cut 1mtr off the trunk of a 4mtr ponga or will this kill it. Was wondering if new branches would come out at the new height. They are Dickinsons. Nick – if they are wheki (Dicksonia squarrosa), look for buds on the trunk below the height you want to cut at. If there are buds, they might sprout fronds when the top is removed. All other NZ species will be killed by cutting the crown off. Just wondering if I can fell wheki at the base and then replant upright, for easy relocation without having to dig up roots and all? I’ve never done it, but I believe it has a chance of working. Garden stores often sell wheki trunks (with no roots and the fronds chopped off) and these can resprout. Probably more likely to work if there are already buds formed on the trunk. I think there is a good chance it will be okay. Dicksonia squarrosa quite likes having wet feet. Just not sure about the clay. Can you cut a ponga dickison log ($20) into several lengths and plant them in the ground so they each come to life? Bunnings re-marked their smaller ponga up from $29.95 to $37.67 in the last week, so they are getting a bit expensive for me to buy already grown. Two large ponga I planted in December, 2013 went into hibernation despite a lot of watering. I thought the drought had killed them, but a few weeks ago, I felt little thongs developing inside. One has now burst into green life, and the other has two thongs that look like they will appear/open before the end of September. I am relieved because they cost an arm and a leg to buy. I’m pretty sure it won’t work with ponga (Cyathea dealbata) or any of the other NZ tree ferns, since they don’t have buds on their trunks. Please help us solve a ponga mystery. A white fluid discharging from a golf ball size hole in a ponga. A loud noise emanating from said hole. Discovered in West Auckland stand of bush. What was it? My six-year old MUST know! Sorry, I don’t know. But maybe it is an insect which has burrowed into the trunk. Perhaps a weta. They can be quite loud. The white fluid is possibly the ponga try to heal the damage. I’ll forward your comment to our entomologists in case they know more. Te Papa’s entomologists say that weta don’t make holes, but they do use (and enlarge) holes made by other animals. You might just have to take a close look! I ‘very been told to feed my poorly Punga with brown sugar right at the top anyone else heard this? We have a life style property with lots of punga – is it possible to compost punga leaves ? They seem to minimize weed growth when I lay them between plants – not sure if this is because there’s something in them that stops other things growing? Composting tree fern fronds should be fine. I’m not aware of any chemicals in them that suppress the growth of other plants. They’ve probably slowed weed growth by shading seedlings – a kind of mulching-effect. Unless it is wheki/Dicksonia squarrosa, I think lopping the top of your tree fern will kill it, unfortunately. If it is wheki, there’s a chance it will resprout. I’m not sure, but I’d initially treat the young, unfurling fronds like you would asparagus. If the stems are thicker, perhaps cook them for a little longer. My ponga/punga is too tall, I want to shorten it but not kill it. If I lop the top off will it regrow? I dont want to kill it. Phil’s suggestion about symbolism is a good one; i.e., the commercialisation and, to some extent, ‘ownership’ of something from nature. Is this good or bad? – plenty to discuss there. This is for one of my essays – well research, and i have to write a few hundred words on ethical issues on the silver fern. but perhaps Megan’s enquiry related to the symbolism of silver fern and koru in nz culture. Hello, just curious to know what are the ethical issues of punga in NZ? In sudamerica punga is a common name for a pickpocket. Don’t know, sorry. Check with some of your local garden/landscape stores. Personally, I’d put a little premium on wheki trunks, since the cut trunk can resprout (which I like, cause you end up with a “living fence”), whereas trunks of ponga/mamaku etc. can’t regrow once cut down. Im in a year 13 business studies class and our business is selling punga trunks cut down to be used for retaining walls and garden landscaping. as research we are trying to find out how much would you pay for a punga per meter? Thank you for the response, I had difficulty in finding any information on growing pungas. Ponga frequently grows on clay hillsides, so should be fine. Probably mamaku too. Wheki might be okay as well, if the soil never dries out much. I don’t know for sure, but I suspect they are not too fussy in cultivation. I have some at home, outside in our clay ‘soil’, and they are doing well. In the wild, silver ferns occur in dryish sites so I’d be wary about having them stand in water. I’m away from work at present. If I can find out more from our library, I’ll post it here. about 14 pungas [silver ferns] growing in pots in my garden in greenwich , london from spores bought in nz [my husbands a kiwi] they took nearly four years to germinate and have since survived three warmish winters but i cant find any specific info on what soil to use to give them the best start, the largest ones trunk is about half a foot & they have lots of spores coming. any info would be greatly appriciated! Sorry, I don’t have any experience with, or knowledge of, this myself. The trunks of wheki seem to be relatively popular in the garden trade, but I don’t know if this is because they are the best. Anyone else know more? i was told that some ‘pongas’ are more suitable than others for fencing – or more accurately as a cladding for clay banks. the claim was that some will rot out quickly and some will last well. do you know if this is so, and which types are to be avoided ? will look for that type in my next purchase. Sorry, I’m not an expert fern-grower. Have they still got green fronds on them? If so, they might just be spending some time establishing themselves (growing roots etc.). I suspect Dicksonia fibrosa is not a fast-grower. If you want a fast growing tree fern and don’t get many frosts, try Cyathea medullaris (mamaku). I have 3 Dicksonia Fibrosa – Tree Ferns, that are not growing. I purchased these from the local Mitre 10. The first summer these produced new ferns, however they now have stopped sprouting [the last 2 years]. I hope you can help. That’s fine; link away. Cool pictures on your site! I’ve been trying to find a nice article on the punga to help explain its relationship to my fractal art for an international audience, yours is great. I hope you don’t mind me linking to it. Glad you found it useful. I’m just back from field-work, much of it in sand-dune country, which is one of the few habitats in NZ where tree ferns are not very common. Maybe “punga” will become an ‘international’ word? Noted your reply, Leon, about tree ferns being uncommon in sand dunes. At Whitiau Scientific Reserve at mouth of Whangaehu River there are broad dune slacks with hundreds of sq metres densely covered in oioi (a rush, Apodasmia similis). Among the rushes I have recorded some 26 fern species, including 5 tree fern species, 3 of Cyathea (C. dealbata, C. cunninghamii, C. medullaris) and 2 of Dicksonia (D. fibrosa, D. squarrosa). 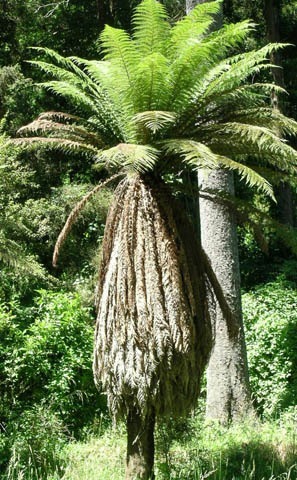 The tree ferns are stunted because any new frond that gets above rush level (about 1 m) gets ‘burnt off’ by salt wind.